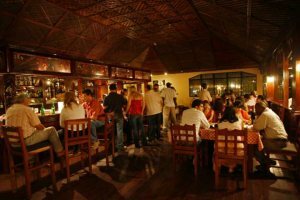 In the evenings, guests have the choice of staying within their hotel or enjoying dinner and drinks in the wide range of restaurants and bars either nearby or a short taxi ride away. Las Vegas it isn't, but there are a number of bars and several clubs. 'The Strip' at Kololi is quite a sight to behold. 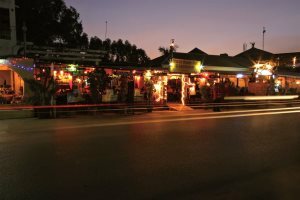 It's grown from a series of shacks on a dirt road to a lively byway full of excellent restaurants, bars and clubs, many of which play music into the early hours. Kotu, South Kotu and Fajara are all low-key resorts with a choice of bars and restaurants within the hotels or a short distance away. None of the late night bar/clubs are close enough to the hotels to disturb the peace and quiet of an evening. Eating al fresco in the evenings is one of the joys of being on holiday in a warm climate. 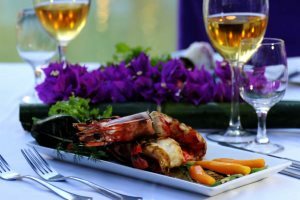 Whatever your taste in cuisine, The Gambia can deliver. Indian, Mexican, Gambian, Thai, Lebanese, Chinese, English and Italian to name a few. The standard is good and prices are lower than in the UK. Discover more. From simple beach bars serving Julbrew to more modern lounge bars there is something to suit all tastes. You’ll find drinks are less expensive than in the hotels and many have a decent menu as well. There are some bars which show live sporting events. There are a couple of nightclubs which are open until the early hours pumping out a mix of pop, hip hop, house, African and Caribbean reggae, Salsa and Ndaga – these range from smart modern clubs with strict dress codes to large open air venues to bars with small dance floors. 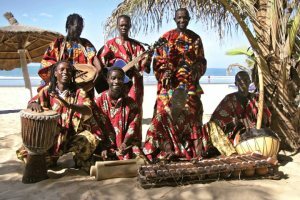 There are many aspects of African music you may hear; from a single Kora player plucking his soft melodies; a drumming group performing with such enthusiasm and rhythm it’s impossible not to tap your feet; to chilled out African Reggae. Discover more. 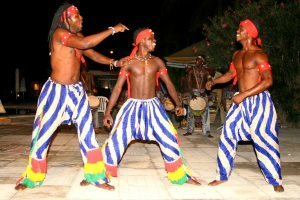 Many of the hotels have visiting dance troups and musicians to entertain guests in the evenings. The vibrant colours, passionate drumming and exuberant dancing are quite intoxicating and if you’re lucky you may see a spot of fire eating. Discover more.